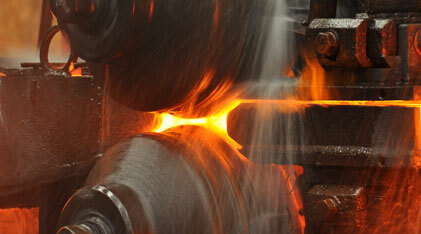 Fully automated, modern block mills fitted with tungsten carbide rollers are utilized for cast billets to be hot rolled. The process is controlled by monitoring devices, in an all mechanized technical operational environment. This enables the production of rebars with perfect shape, uniform thickness & equal standard length. The rolling mills, operating in tandem with the continuous casting machine, helps reduce the material throughput time and ensures excellent dimensional tolerance and surface finish. Quenching The process quenches the surface layer of the hot rolled bar, which pressurizes and deforms the crystal structure of intermediate layers, and simultaneously begins to temper the quenched layers using the heat from the barâ€™s core. Self tempering – Here the bar leaves the quench box with a temperature gradient through its cross section. As a result, heat flows from the barâ€™s centre to its surface. The barâ€™s heat and pressure correctly tempers an intermediate ring of martensite and bainite. Atmospheric cooling This automatically tempers the austenitic core to ferrite and pearlite on the cooling bed and results in a strong, tough, tempered martensite in the surface layer of the bar, an intermediate layer of martensite and bainite, and a refined, tough and ductile ferrite and pearlite core a unique combination of strength and ductility.